Magnetic bead kits are widely used in bioscience laboratories nowadays, as their development and perfecting during recent years has been significant. Both scientists in research labs, for immunoassays and magnetic separation processes, and lab technicians in hospitals, using IVD kits for molecular diagnostics, have experienced an improvement in their separation processes due to these magnetic bead kits. As using a biomagnetic separation process has proven useful for these applications, the increasing demand in magnetic beads has lead providers to develop cost-effective ways for their production. Why is a magnetic separation process so difficult to scale up? The main issue regarding the scale up of the separation steps in magnetic bead production is the unsuitability of the techniques used for development when these are later performed in an industrial scale. When beads are produced for magnetic separation processes, after they are functionalized, they are processed in order to extract the beads from the supernatant. The methods of choice for processing used to be centrifugation, filtration or tangential filtration. All these methods are slow, unreliable, and costly, involving substantial bead losses, and are the only choices when the beads are not magnetic. However, a magnetic separation process can be performed for magnetic bead separation, allowing for an easier and cleaner extraction. 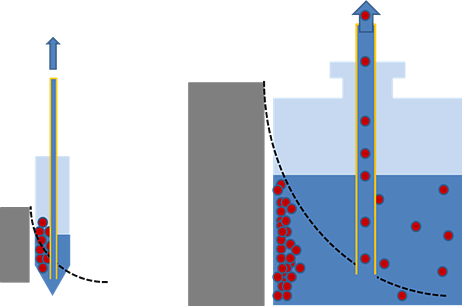 When a magnetic separation process is the method of choice for separating the beads from the supernatant in IVD kit production processes, scaling up is rarely straightforward. This is due to the conditions for separation, which are often based on empirical evidence and linked to the specific piece of equipment on which they had been optimized during the development stages. Apart from that, the device used in the laboratory for lot production testing and development is usually a simple magnetic separation rack producing non-homogeneous magnetic forces. Simplest devices don’t allow to define the magnetic state of the beads precisely enough, hampering the ability to extend the conditions to an increased volume. This often leads to problems with reproducibility and batch consistency. To avoid such issues, the initial parameters can be thoroughly examined, independently of the equipment, and then attempts to recreate the conditions can be made. A simpler and less costly solution is to use a homogeneous system for the magnetic separation process, in which the beads experience a constant and well-defined magnetic force. But what is the difference between homogeneous and non-homogeneous separation devices? 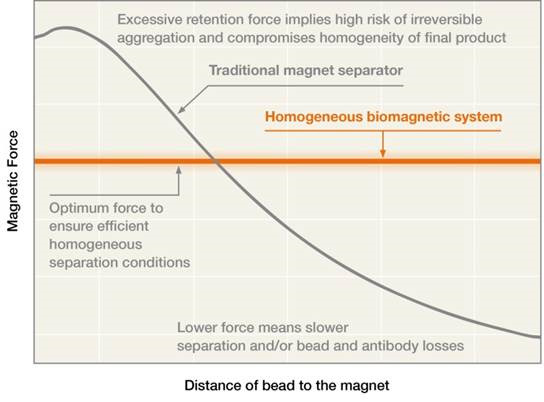 In non-homogeneous separators, magnetized beads experience a magnetic force that varies according to their distance from the magnet. Beads that are farther away experience a weaker force, taking a long time to reach the retention position. On the other hand, magnetic beads sitting near the magnet (in the retention position) experience stronger forces throughout the magnetic separation process. An increase in batch volume further increases the distance from the magnet in the most distant beads. The subsequent increase in separation time is disproportionate to the corresponding increase in volume, but necessary to avoid bead losses at unreasonable levels. This exposes the beads closest to the magnets to high magnetic forces for an extended period of time, resulting in bead aggregation that requires additional steps for disaggregation and yields lot-to-lot inconsistencies. In contrast to a simple magnetic separation rack, a homogeneous magnetic separation process generates a consistent magnetic force on all beads, irrespective of distance from the magnet. The force over the farthest beads is higher, reducing the separation time and the losses. At the same time, this force can be gentle enough to avoid aggregation while keeping the beads on the vessel walls retained. Both factors (short separation time and gentle retention force) avoid aggregation issues associated with prolonged exposure to high magnetic forces. Homogeneous separation conditions allow the use of monitoring devices in the process, enabling an early detection of bead aggregation since aggregates will move faster than expected, and solve the safety risks related to simpler devices: This is because homogeneous systems are often closed and have lower-level demagnetization fields, so smaller danger and caution areas are needed. In conclusion, homogeneous biomagnetic separation systems are an overall improvement for any magnetic separation process related to magnetic bead production processes. Provided that one of these systems is used, all beads exposed to the magnetic field will experience the same magnetic force, avoiding most disadvantages of non-homogeneous systems. On the one hand, farthest beads will experience a magnetic force high enough to allow for a fast separation; on the other hand, nearest beads won’t be exposed to excessive magnetic forces for a long time, reducing the risk of bead aggregation. 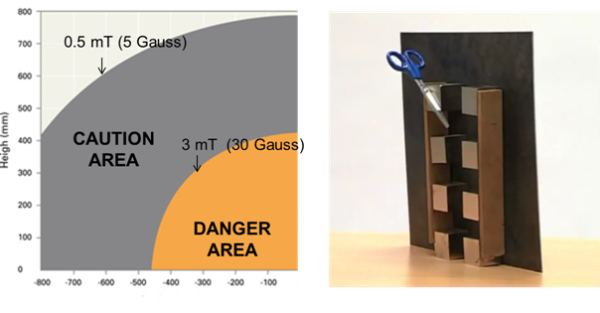 Altogether with the reduction of safety risks and needed space, the main consequence of this homogeneous magnetic force is an improved consistency between the produced IVD kit lots. As the magnetic separation process is well parameterized in these systems, corrective measures can be applied earlier in the process, saving time, effort and money and contributing towards the overall quality of the product. Production of magnetic beads kits: To be magnetic or not to be?